Livonia, as shown in the map of 1573 of Joann Portantius. In 1577, having lost Ivan's favor and getting no support from his brother, Magnus called on the Livonian nobility to rally to him in a struggle against foreign occupation. Ivan's forces attacked him and took him prisoner. On his release he renounced his royal title. Magnus spent the last six years of his life at the castle of Pilten in the Bishopric of Courland where he died (March 1583) as a pensioner of the Polish crown. 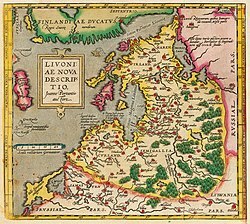 The end of the Livonian War in August 1583 saw most of the territory of Old Livonia (Duchy of Courland and Semigallia and Duchy of Livonia) under the control of the Polish–Lithuanian Commonwealth, with Swedish control established in the Duchy of Estonia. ^ Viirand, Tiiu (2004). Estonia. Cultural Tourism. Kunst Publishers. pp. 82–84. ISBN 9949-407-18-4. ^ De Madariaga, Isabel (2006). Ivan the Terrible. Yale University Press. ISBN 0-300-11973-9. ^ Oakley, Stewart Philip (1993). War and Peace in the Baltic, 1560-1790. Routledge. ISBN 0-415-02472-2. ^ Lockhart, Paul Douglas (2004). Frederik II and the Protestant Cause: Denmark's Role in the Wars of Religion. BRILL. pp. 38–39. ISBN 90-04-13790-4. This page was last edited on 28 February 2019, at 22:46 (UTC).